Ann and Charles Hoehn have been breeding and showing Birmans deep in the Heart of Texas for well over 35 years! Many Supreme Grand Champions bear the Annbirwaves prefix. Ann was instrumental in introducing the red, lynx (tabby), and cinnamon genes to the breed in the U.S. She is also a TICA Allbreed judge and has been judging for over 25 years! For a time, Ann joined forces with two other Texas Birman breeders to form the Birmnsrus Cattery and bred many beautiful Birmans under that name. After Sharon Hunt passed away and Pat Holmes retired, Ann has returned to her original cattery name... Annbirwaves. The cattery name stemmed from Ann's original two breeds, the Birman and Cornish Rex. She used her name, the "Bir" from the Birman and "Waves" from the curly Cornish Rex. Ann's first Birman pair were Kumar's Chauncey and Purzzfine Chelsea. 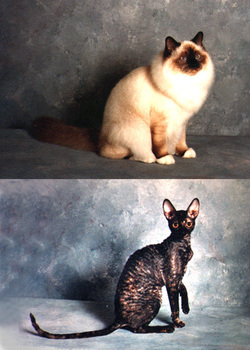 One of her many Supreme Grand Champions was Annbirwaves Incognito, the seal point on the left, who was in the top twenty TICA cats. The tortoiseshell Cornish Rex was Leo's Lair Lizbeth... shown the same year, she also was an International Winner.